Background: Various enzymes have been assessed as biochemical markers and aspartate aminotransferase (AST) is one such marker that has received considerable attention recently. Analysis of gingival crevicular fluid (GCF) has been pursued as a means of identifying the sites undergoing active disease. A problem central to periodontology today is the inability to detect actively deteriorating sites and highly susceptible patients other than by longitudinal observations of attachment. Hence, AST levels from samples of GCF can be taken as an indication for active periodontal tissue destruction. Aim: To estimate the levels of AST in the GCF in periodontal health and disease. Materials and Methods: This study was an in vivo, case control, and clinico-biochemical assay. Eighty samples were selected which were divided into four groups of 20 patients each based on Russell's Periodontal Index. Statistical analysis: The values obtained for AST level in the different groups were subjected to Student's " t" test. Results: The mean of AST level showed an increase from Group I to Group IV. These values ran parallel with the values of clinical index, i.e. more severe the inflammation, higher the index score and higher was the AST level. Conclusions: It was concluded that as the severity of inflammation increases, there is a significant increase in the AST levels suggesting that there is a direct relationship between the AST levels in the GCF and periodontal destruction. Amongst all these, the biochemical markers have widely gained acceptance and importance. Hence, in the present study, an attempt has been made to estimate the levels of AST in GCF in periodontal health and disease. This study was an in vivo study conducted in accordance with the ethical standards on human experimentation and was approved by the ethical committee of S.D.M. College of Dental Sciences, Dharwad. All the subjects were informed about the study and a written consent was taken. 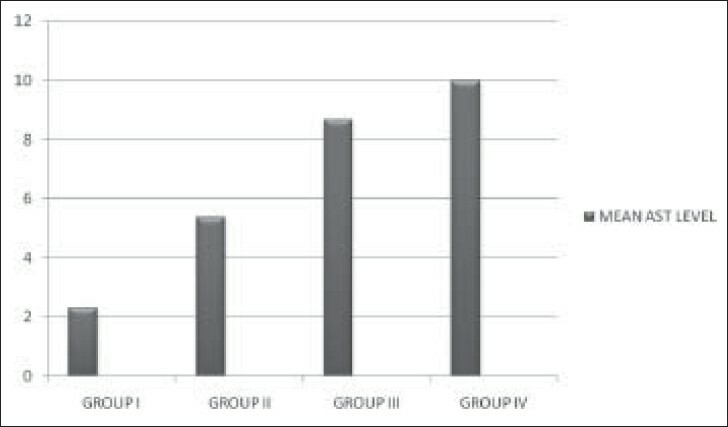 The subjects were then classified into four groups depending on Periodontal Index (PI) Score. Group I represented the control group. It consisted of 20 patients (15 males and 5 females) without any signs of gingival inflammation with the PI Score ranging from zero to 0.2. Group II consisted of 20 patients (14 males and 6 females) with the PI Score ranging from 0.3 to 0.9. Group III consisted of 20 patients (9 males and 11 females) with the PI Score ranging from 1.0 to 2.0. Twenty patients (11 males and 9 females) formed Group IV, with the PI Score ranging from 2.1 to 5.0 and above. The procedure was simple and direct. The patients were asked to gargle vigorously with a glass of sterile water to cleanse the tooth of loosely adherent debris. The test site was dried and isolated with cotton rolls. Volumetric micropipettes were placed extracrevicularly and a standardized volume of 1 μl was collected with the help of a plunger and measured within the micropipette. Multiple sites were selected to collect GCF. The test sites that did not express any volume of fluid and the micropipettes contaminated with blood and saliva were not included in the study. The GCF collected was immediately transferred to a test tube containing 0.1 ml of phosphate-buffer saline (pH 7, 0.05 M). The test tubes were immediately taken to the Department of Biochemistry for analysis. About three to four samples were collected per day, and all the samples were collected in the morning. The Stangen SGOT (AST) kit is intended for the in vitro quantitative determination of SGOT (AST) activity. This kit is based on Reitman and Frankel's method. The assay was carried out as per the manufacturer's instructions. For the enzyme assay, clean and dry test tubes were taken and were labeled as Blank (B) and Test (T) as shown below. Mix well, allow to stand at room temperature for 10 min, and measure the absorbance of Test (T) against Blank (B) on a spectrophotometer at 505 nm. This gives the optical density of the Test (T) at 505 nm. To get the enzyme activity, a calibration curve was plotted by using pyruvate standard, and the absorbance (optical density) of Test (T) on the y-axis was read against the corresponding enzyme activity on the x-axis. The entire procedure from the placement of micropipettes till the determination of enzyme activity took about 3 h.
The various findings in relation to the selected individuals were recorded using a proforma designed for this purpose. The mean values obtained for AST level in the different groups were subjected to statistical analysis by applying Student's "t" test. It consisted of 20 patients, of whom 7 did not show any AST level in the GCF collected whereas the remaining patients showed AST level in the range of 2.50-5.00 IU/ml. The mean was 2.313 and standard deviation was 1.998. It consisted of 20 patients. Only one patient did not show any AST level in the GCF collected, whereas the remaining patients showed AST levels in the range of 2.50-10.00 IU/ml. The mean and standard deviation were 5.375 and 2.871, respectively. It consisted of 20 patients. All the 20 patients showed raised AST levels in the GCF collected, in the range of 5.00-20.00 IU/ml. The mean and standard deviation were 8.662 and 4.648, respectively. It consisted of 20 patients. All the patients showed AST levels in the range of 5.00-37.50 IU/ml in the GCF collected. The mean was 10.00 and standard deviation was 7.906. In the computed results [Table 1], when Group I was compared to groups II, III, and IV, it was found to be highly significant at <0.001 probability (P < 0.001). The probabilities were 0.0004, 0.000, and 0.00001, respectively. When Group II was compared to groups III and IV, it was found to be significant at <0.05 probability (P < 0.05). The probabilities were 0.0105 and 0.0186, respectively. When Group III was compared to Group IV, it was found to be nonsignificant (P > 0.05), the probability being 0.5182. The mean of AST level showed an increase from Group I to Group IV. These values ran parallel with the values of clinical index, i.e. more severe the inflammation, higher the index score and higher was the AST level [Figure 1]. Evidence from a variety of sources suggests that human periodontal diseases may occur by a series of repeated episodic exacerbations. Periodontal disease is seen to proceed in bursts of activity that occur randomly at periodontal sites throughout the mouth. Following these destructive bursts, periodontal sites appear to remain quiescent for an undetermined period of time. Some of the procedures traditionally used cannot distinguish between disease activity and inactivity at a given point of time. Various enzymes have been assessed as biochemical markers and AST is one such marker that has received considerable attention recently. In the present study, AST levels in GCF were compared using clinical index (Russell's Periodontal Index). The results clearly showed that as the severity of clinical inflammation increases, AST level also increases. In Group IV, i.e. severe inflammation with deep pockets, few patients showed very high levels of the AST enzyme, some showed a significant increase, while a few showed a slight increase. Patients who showed high and significant AST levels might be in an active state of the disease, whereas the others may be in a state of quiescence due to the chronicity of the lesion. The results of this study show that as the severity of inflammation increases, the AST level in GCF also increases. So, from this study it can be deduced that AST is a potential biochemical marker of tissue destruction and can be used to measure active tissue destruction and thereby disease activity. The study sample consisted of 80 patients who were divided into four groups of 20 patients each as per Russell's Periodontal Index. GCF was collected for biochemical analysis to estimate the AST levels. As the severity of inflammation increases, there is a significant increase in the AST levels suggesting that there is a direct relationship between the AST levels in the GCF and periodontal destruction. GCF in the destructive phase of periodontal disease possesses a greater amount of AST. AST may be used as a potential biochemical marker for the assessment of gingival inflammation and periodontal disease activity. 1. Reddy MS, Jeffcoat MK. Periodontal disease progression. Curr Opin Periodontol 1993;52-9. 2. Johnson NW. Crevicular fluid based diagnostic tests. Curr Opin Dent 1991;1:52-65. 3. Nevins M, Becker W, Kornman K. Periodontal diagnosis and diagnostic aids. Proceedings of the World Workshop in Clinical Periodontics. Am Acad Periodontol 1989;1:1-22. 4. Kornman KS. Nature of periodontal diseases: Assessment and diagnosis. J Periodontal Res 1987;22:192-204. 5. Page RC. Host response tests for diagnosing periodontal diseases. J Periodontol 1992;63:356-66. 6. Armitage GC. Diagnostic tests for periodontal diseases. Curr Opin Dent 1992;2:53-62. 7. Cohen RL, Alves ME, Crawford JM, McSwiggin T, Chambers DA. Association of gingival crevicular fluid aspartate aminotransferase levels with histopathology during ligature induced periodontitis in the beagle dog. J Dent Res 1991;70:984-7. 8. Imrey PB, Crawford JM, Cohen RL, Alves ME, McSwiggin TA, Chambers DA. A cross - sectional analysis of aspartate aminotransferase in human gingival crevicular fluid. J Periodontal Res 1991;27:75-84. 9. Lang NP, Bragger U. Periodontal diagnosis in the 1990s. J Clin Periodontol 1991;18:370-9. 10. Raetzke PB. New diagnostic tests in Periodontics. J Indian Dent Assoc 1993;64:89-92. 11. Page RC. The role of inflammatory mediators in the pathogenesis of periodontal diseases. J Periodontal Res 1991;26:230-42. 12. Polson AM, Goodson JM. Periodontal diagnosis. Current status and future needs. J Periodontol 1985;56:25-34. 13. Curtis MA, Gillett IR, Griffiths GS, Maiden MF, Sterne JA, Wilson DT, et al. Detection of high risk groups and individuals for periodontal diseases: Laboratory markers from analysis of gingival crevicular fluid. J Clin Periodontol 1989;16:1-11. 14. Russell AL. A system of classification and scoring for prevelance surveys of periodontal disease. J Dent Res 1956;35:350-9. 15. Ryder MI. Histological ultrastructural characteristics of the periodontal syndrome in the rice rat. I. General light microscopic observations and ultrastructural observations of initial inflammatory changes. J Periodontal Res 1980;15:502-15. 16. Chambers DA, Imrey PB, Cohen RL, Crawford JM, Alves ME, McSwiggin TA. A longitudinal study of aspartate aminotransferase in human gingival crevicular fluid. J Periodontol Res 1991;26:65-74. 17. Persson GR, DeRouen TA, Page RC. Relationship between levels of aspartate aminotransferase in gingival crevicular fluid and gingival inflammation. J Periodontal Res 1990;25:17-24.